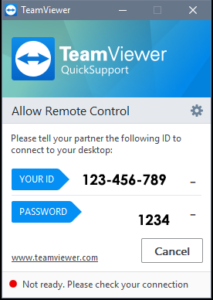 In order to receive Remote Support from AudioScribe, you will need to download TeamViewer. If prompted by your internet browser, please RUN. After you run, the software will open. The ID and password may be blank for a few seconds. Once TeamViewer connects to the internet, it will populate the ID and password. Call 800-869-0569 to speak to support. Please provide your information to your support technician. Please be aware that you must be current in your support contract to receive support. Charges will apply if not in contract.